Destroy Flutter Valley? Not on the Ponies' Watch! It�s a race against the clock as the Ponies try to save Flutter Valley from Queen Bumble and the witches from the Volcano of Gloom. It�s My Little Pony�s greatest adventure! Witches from the volcano of gloom plot to ruin the sun tuesday celebration in flutter valley. The witches enlist Queen bumble and the bees from Bumbleland to steal the flutter ponies' sunstone, spelling disaster for flutter valley. The clock is ticking for the ponies when queen bumble heats up flutter valley with the stolen sunstone. When queen bumble captures the flutter ponies, moring glory seeks the help of megan, a young girl who helps the ponies when they're in trouble. 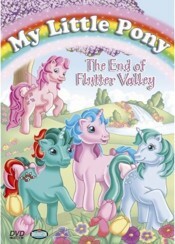 Megan and the ponies must free the flutter ponies, recover the sunstone, and return it to flutter valley before sunset. The stone backs emerge as unlikely heroes in recovering the sunstone. But now it's a race against the sun - is there still time to save flutter valley?